For US Person, birds epitomize the idea of freedom. Their ability to fly great distances, in all weathers, and even eat and sleep on the wing makes them almost independent of earth. Hummingbirds and albatrosses represent the poles of flying performance. No bird is more aerobatic than the hummer; it can fly backwards, upside down, and hover in place. No bird can fly more efficiently or longer distances than the albatross; it can stay at sea for year or more. But even albatross must return to land to breed. Breeding in the anthropocene is problematic for Australia's only endemic albatross, the shy albatross (Thalassarche cauta). It nests on only three islands off the coast of Tasmania: Albatross Island, Pedra Branca, and Mewstone. They lay a single egg in late September. Higher temperatures and increased rainfall have played havoc with the mud and vegetation cones they build themselves. Monitoring indicates that poor-quality nests make less likely that a single chick will survive to fledge. So Australian conservationists have stepped in to give the shy bird a helping hand. 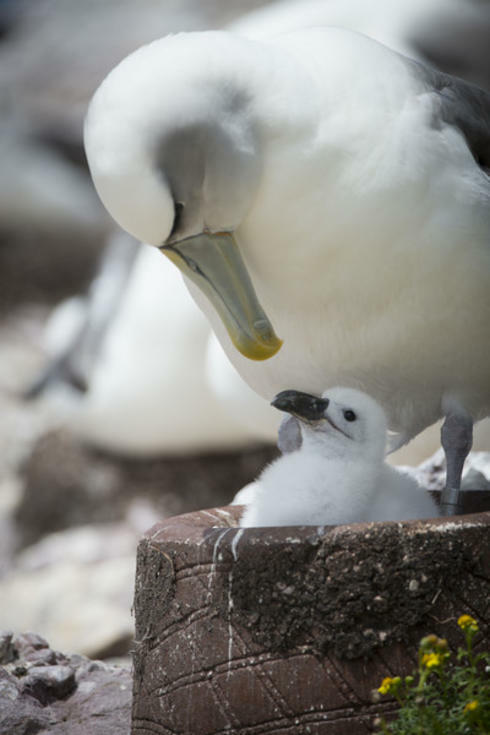 Over 100 specially built mud brick and aerated concrete artificial nests were airlifted on to Bass Strait’s Albatross Island in July 2017 to trial a program to increase the breeding success of the albatross. Happily, the vulnerable birds have accepted the artificial nests and personalize them with their own touches. [photo credit: M. Newton/WWF]. The artificial nests are lasting longer than natural ones, thus allowing chicks time to develop. When they are fully grown and about to leave the island, scientists will attach tiny transmitters, so their movements can be tracked and perhaps explain why so many juveniles are not surviving at sea. Juveniles are know to fly as far as South Africa. As of 2007 their were about five thousand breeding pairs on Albatross Island, up from the low point of 300 pairs in 1909 when they were killed for their white feathers.